With your support and wishes, Mulberry Lifestyle is getting ready for its first International Exhibit in Dubai next week. We will be launching our exclusive Collection of Jackets for the International Market at International Apparel & Textile Fair, 2017, the leading Apparel Fair in the world. You have been a part of our journey, helping us with new ideas and in our growth. We will be happy if you can invite your friends, family and associates in Dubai, on our behalf, to meet us at IATF, Dubai. Yes, Nehru Jacket is the new Summer Jacket this season. It is summer time already across India and fashion savvy people all over have been looking for alternatives to dress men and add that Classy touch to their clothing. These Nehru Jackets are made of finest quality European Linens in vibrant pastel shades, something that will never stop breathing. 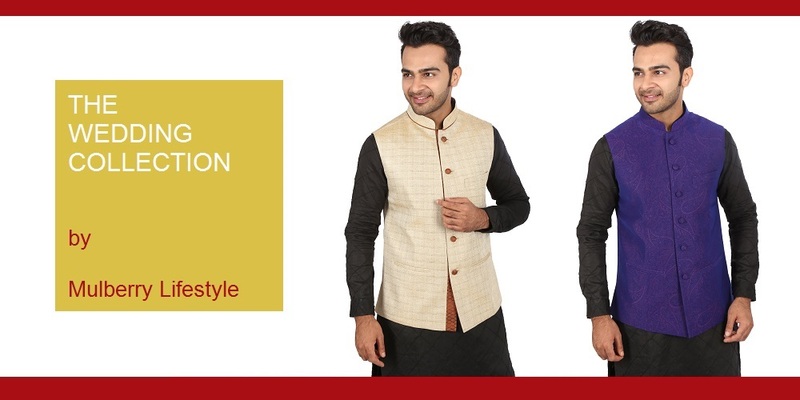 There is nothing classier & sexier than a Nehru Jacket when it comes to mens ethnic wear! This conventional jacket, popularized by Pandit Jawaharlal Nehru, has been seen sported by some of the most striking personalities like the Beatles & James Bond! A safe and posh choice for all festive occasions, make sure to grab one! The Wedding Collection by Mulberry Lifestyle is a set of Jackets to complement the grand occasion. It is meant for the groom as well as all the guests attending the wedding. The Jackets are infused with traditional looks and feel, yet keeping it very chic and modern. It can be paired with Jodhpuri Pants, Denim or a simple trouser. Camel color shoes and trouser works best with Jackets.